The demands of modern society often create distance between Jews and their cultural heritage. Author Barbara Sheklin Davis, a New York City native and longtime Jewish educator, offers ways to embrace and uphold Jewish influences in everyday life. Suggestions range from simple activities like indulging in a Woody Allen movie marathon and noshing on pastrami on rye to more involved activities including hosting a Shabbat dinner or exploring tikkun olam to bring about social justice and repair the world. 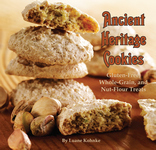 Featuring 13 gluten-free recipes along with classic cookies interpreted with flours from their regions of origin, Luane Kohnke’s newest cookbook is a delightful addition to any kitchen! The terrorist attack of September 11—one of history’s blackest days—shook America to its core, but at the same time galvanized an aroused nation to action. Leading editorial cartoonists capture in this volume that swift response—the horror, the grief, the pain, the unity, and, finally, the resolve to crush the scourge of terrorism wherever it exists—with a section in this year's edition devoted to the terrorist attack on America. Paperback Original. Written entirely in Spanish, Cocina Criolla, the standard reference work on traditional Puerto Rican cooking, has sold more than 200,000 copies and has special appeal to those who enjoy the island’s cuisine. Hardcover. Written entirely in Spanish, Cocina Criolla, the standard reference work on traditional Puerto Rican cooking, has sold more than 200,000 copies and has special appeal to those who enjoy the island's cuisine. It’s Christmas Eve, and Cody’s family has all gathered for their traditional Christmas party—all except Grandpa, who is sitting quietly in his room, looking out his window at the cloudy sky. Grandpa tells Cody about his time in Vietnam and the Christmas Eve when a bright star appeared through the clouds, giving the soldiers hope. Changing flat tires and rescuing kittens wasn’t what one patrol officer had in mind for Christmas Eve. Amid idle chatter and doughnuts, this small-town cop is missing his family and wishing for a little holiday cheer. Nevertheless, he is a patrolman on duty and must bide time until the graveyard shift is over. Unless . . . there is someone willing to take his place. No serious boater planning a cruise in the area would want to be without Cruising Guide to New York Waterways and Lake Champlain, written in the same format as Pelican’s other famous cruising guides. Paperback. Each entry includes a few sentences describing procedure and providing fun facts about this exhilarating profession. Here is everything about firefighting, from bucket brigades to mobile command vehicles. Examples are J is for Jaws of Life®, M is for Mobile Command Vehicle, and T is for Thermal Imaging Camera. Vehicles and high-tech equipment are described in a manner that is action packed and informative. Find out why firehouses use dogs as mascots, how fire trucks can override traffic signals, why fire hydrants are color coded, and which vehicle carries scuba gear. ’Round Christmastime, things are a little different on the Emerald Isle. Father Christmas with his Irish eyes twinkling ushers in his seven elves, to enjoy the poteen and plum pudding and unpack his large sack. And thus begins the wondrous Irish Night Before Christmas. Hardcover. This turn-of-the-century tall tale shows that even a giant frog can be friendly and helpful, when given a purpose and embraced in a spirit of collaboration and community. The townspeople of Empeyville have plenty of work for Joshua, and he is happy to oblige, since every day ends with swimming and playing in the local pond. Amusing illustrations depict small-town life in nineteenth-century upstate New York, and history hops ahead in this Americana tribute to hard work, teamwork, and resourcefulness. The Italian influence on America began in the age of exploration when Christopher Columbus, Giovanni da Verrazzano, John Cabot, and Amerigo Vespucci ventured across the Atlantic and discovered a New World. During the subsequent centuries, millions of Italians have immigrated to the United States, bringing with them a distinct set of beliefs, traditions, and customs which have been preserved and passed down through the generations. One of the first important works of American comic literature, this satirical history of New York was initially published to popular acclaim in 1809. Spanning the creation of the world to the end of the “Dutch Dynasty,”Â this humorous history examines the discovery of New York, the first settlements of the Dutch, the reign of Peter Stuyvesant, and the gallant achievements of Peter the Headstrong, among many other real and imagined moments in the history of this essential American city. An immensely significant biography of the powerful activist Lillian Wald, a social and education reformer dedicated to helping less fortunate citizens in New York.